Phyto-Vite is a state-of-the-art nutritional supplement providing chelated minerals, vitamins and a diverse group of antioxidants. The antioxidant coverage provided by Phyto-Vite is both comprehensive and diverse. First, it includes optimal amounts of vitamins A, C, and E as well as the pro-vitamins alpha and beta carotene. The inclusion of these powerful antioxidants provides protection against the oxidative damage caused by free-radicals. Increased immune system support, increased protein and hormone synthesis, increased soft tissue integrity and improved circulation are just a few of the many effects of these antioxidants. Esterified vitamin C is used in Phyto-Vite to ensure quicker uptake and a decreased rate of excretion. Ginkgo biloba has been added to promote healthy brain function and circulation of blood to the brain, as well as to inhibit lipid peroxidation. A phytonutrient blend obtained from entire plant sources has been incorporated into Phyto-Vite to further enhance its antioxidant effects. Key phytonutrients included are lutein, lycopene, soy isoflavones, and allicin. To ensure optimum absorption and maximum antioxidant effects, Phyto-Vite includes the minerals copper, zinc, manganese and selenium in a chelated form. 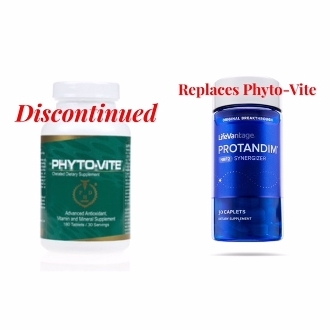 Phyto-Vite has several unique features such as the inclusion of canola oil to ensure proper absorption of fat-soluble vitamins even on an empty stomach, and an extended-release formulation to allow flexibility in serving size. This product is gluten free. Phyto-Vite is white listed by the Netherlands Security System Food Supplements Top Sport (NZVT). OTHER INGREDIENTS: Microcrystalline Cellulose, Croscarmelose Sodium, Silica, Stearic Acid, Magnesium Stearate, Pharmaceutical Glaze With Vanillin.Contains Milk & Soy. This formula is free of yeast, wheat, starch and artificial flavors. DIRECTIONS: As a dietary supplement, take three (3) tablets per day. **WARNING: Accidental overdose of iron-containing products is a leading cause of fatal poisoning in children under 6. Keep this product out of the reach of children. In case of accidental overdose, call a doctor or Poison Control Center immediately. If pregnant or lactating, consult a physician before using. Store at 15-30°C (59-86°F). Ferrochel® is a registered trademark of Albion Labs, Inc.
Pure-Gar® is a registered trademark of Essentially Pure Ingredients.